Sponge guard is called nenua in eastern UP and turai in the western parts of UP. Tori is the punjabi name and there must be at least 20 names in other Indian languages for sponge gourd. I named this post nenua ki subzi because it is made in a traditional eastern UP way. A simple stewed curry bursting with all the flavors of this humble vegetable taking center stage, so if you don't like the taste of this veggie this is not the curry for you. And if you like the taste of sponge gourd this is the curry you'd love the most. 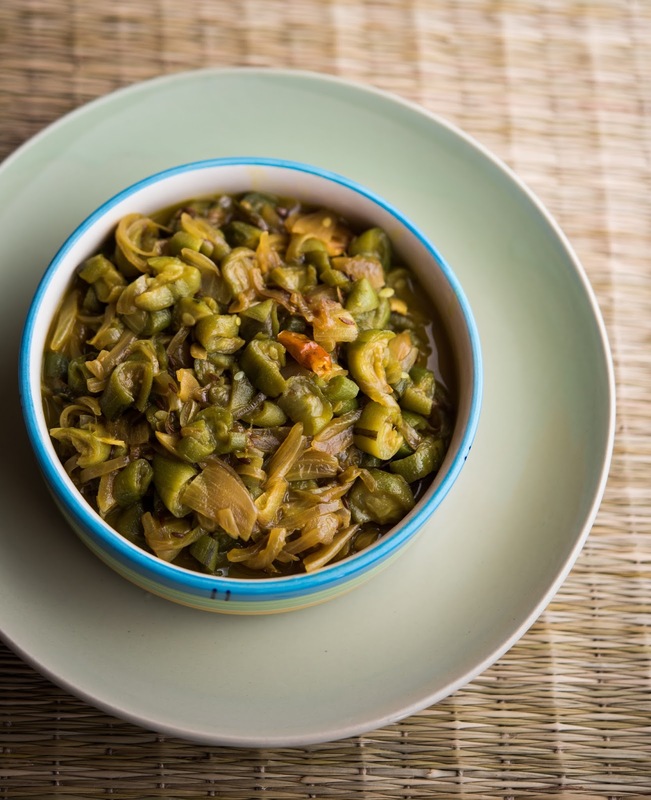 This stew has a sweetish taste because of caramelized onions and a mild hot kick imparted by the green chilies. This is a family favorite and one of the light curries which is repeated numerous times during sponge gourd season. There is nothing fancy in the ingredient list and it takes about 10 minutes to cook if it is for 2-3 people. It can be a side dish but you will be surprised that it's always a main (only) subzi with our roti subzi dinner which always ends with a .... Waah...mazaa aa gaya ! (enjoyed-the-meal-thoroughly-statement). And I love to hear those words trust me. I have done nothing to make this humble vegetable tasty this way. It is a traditional dish and is made the same way all around Eastern UP and many of my friends from other places have loved it. Many people like this curry with rice too. Nenua pyaz ki subzi and plain boiled rice is a favorite combo meal for many people of my mom's age (including her) who prefer light meals. Other variants of this curry are loved more with rice and those recipes will be coming on this space soon. Slit the green chilies lengthwise , cut the onion in half vertically and then make slices , peel the sponge guard and slice them in coin shaped slices. Heat oil in a kadhai and throw in the cumin seeds and wait till they crackle. Throw in the slit chilies taking care to protect your face if it splutters hard. Add the sliced onions and stir fry till they become translucent and a few of them start turning pink. Throw in the turmeric powde , stir a bit and throw in all the sliced nenua slices ... mix well, add salt and cover and cook at low heat. The sponge guard releases it's own sap and gets cooked into its own juices. If you are using larger sponge gourds it releases so much water (especially if the guards are a bit large) that it become soupy. You may want to reduce the watery curry to make it almost dry or a little watery, I like mine a bit watery sometimes. Serve this curry hot with rotis or with anything you fancy. I know this curry is a major craving for many Eastern UP people who do not get this sponge guard in other places. 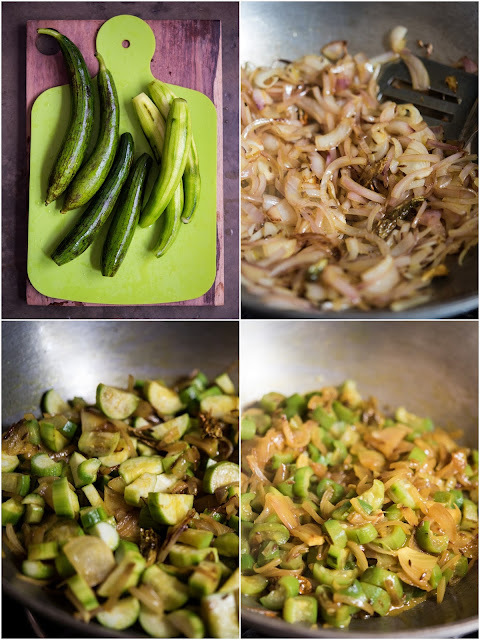 Try making this curry with zucchini instead and the flavors will be a bit similar if not absolutely the same. Do not replace green chilies with red chilies though, it makes a difference in such a simple flavored curry. Sweetish with the flavors of nenua and pyaaz and a hint of sharp heat of green chilies, this is the way I sum up the flavours of this curry. Call it nenua ki subzi, tori ki subzi, turai ki tari wali subzi or sponge guard soup,this is the most traditional way of healthy eating. Home cooked Indian food is the most healthy food. As i said it is a favorite with our mother's generation more ... we just love it. I see those pile of Nenua in the market and never ventured to make anything. Now I think I will make it and go with your recipe. Now it is finally here! :) We call it turia here and i make it with a tadka of fennel, cumin, curry leaves, red chilli and dhana-jeera with sauted onion and tomato..
... thanks again to all of you who mailed me. sangeeta, see how addicted i have got to your blog :) I cook tori very frequently, i liked this variety , gonna try this soon. can you also post kachori and the green chutney recipe which we take with kachoris. Please pardon me if you have already done it in your blog, i am yet to go through all your posts. This addiction i like !! Don't like this, but Ma used to cook this...always avoided eating it. Can change my concept and give it a try. I know Gauri ...this is not the curry for you if you don't like this veggie....as i said ..